Khadija was now pregnant with Fatima and as she says, it was an easy pregnancy because the embryo would speak to her from inside her womb. Khadija did not inform the Prophet about this miraculous occurrence, but one-day when she was home alone, he found Khadija speaking to someone. He inquired as to whom she was speaking to, she replied, â€œThat which is in my womb, surely it speaks to meâ€. The Prophet then cheerfully said, â€œRejoice Khadija, for this is the girl whom Allah has made to be the mother of eleven of my successors who will come after me and after their fatherâ€. So for the duration of the pregnancy, Fatima was comforting her mother who had been deserted by the women of Quraysh because she married the poor orphan, Mohammad. When Fatima’s delivery came near, Khadija sent for the qurayshi midwives, who still refused to help her. But by the grace of Allah, four of the most beautiful women came to help her in this time of need, as she says, â€œWhen Fatimaâ€™s delivery came near, I sent for the qurayshi midwives who refused to help me because of Mohammad. During childbirth four ladies whose beauty ad brilliance were indescribable entered the house, each one began to introduce herself. The first one said, â€œI am your mother Eveâ€. The second one said, â€œI am Asiya bint Muzahim, Firauns wifeâ€. The third one said, â€œI am Kulthum Musaâ€™s sisterâ€, and the fourth one said, â€œI am Mariam bint Imran, Isaâ€™s mother, we have come to deliver your childâ€. So with the help of these heavenly ladies, Fatima was delivered. She was born on the 20th Jamadi al-Akhir. She fell to the ground in the position of prostration and the brightness and brilliance of her face illuminated the skies from east to west, and for this reason she was named â€œAl-Zahraâ€, lady of light. 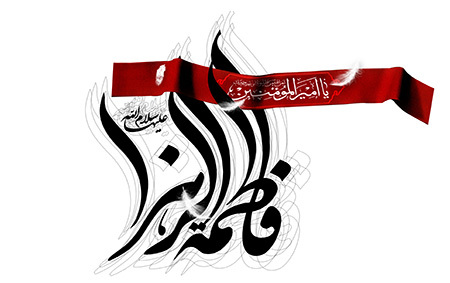 Al-Zahra is known by nine names, such as Fatima. She was named Fatima because she and her followers are protected from hell. She is also Al-Siddiqa meaning she is a woman who has scrupulous honesty and sincerity, believing in the commands of Allah and his Prophet, never doubting for one moment. She is also Al-Mubaraka, which means the blessed one because abundant blessings originated from her, such as the necklace that fed a hungry man, satisfied a poor man and freed a slave. Jabir bin Abdullah Al-Ansari relates that an old man weak from hunger came to the Prophet and asked to be fed and clothed. The Prophet did not have anything to give him so he sent him to Fatimaâ€™s house. When he arrived he asked the same of her, so she gave him a necklace. He took the necklace and went to the mosque and showed the Prophet. The Prophet said, â€œsell it for Allah will grant you a solution to your problems because it was given to you by the Mistress of All Women. Meanwhile Ammar bin Yasir asked the Prophet if he had permission to buy it. The Prophet gave him permission so Ammar paid generously for it, then he gave the necklace to Sahim, his slave and said give it to the Prophet and tell him that I give you to him also. The Prophet said to the slave, take this necklace and give it to Fatima and tell her that I gave you to her. When the slave reached Fatima, she took the necklace and told the slave that he was free. Upon hearing this the slave laughed. Fatima asked him the reason that made him laugh. He answered: â€œI smiled when I thought of the abundance put in this necklace, it fed a hungry man, freed a slave and returned to its original owner. We now understand why she was Mubaraka. Some other names she is known by, are Al-Tahera, meaning she was virtuous and pure, cleansed from all sin, and she was Al-Batool, meaning she was chaste and pure, safeguarded from menstruation and childbirth bleeding. She is also Al-Zakiya, meaning the chaste and Al-Radhiyah, the satisfied or gratified one, and of course Al-Mardhiya which means she who pleases Allah. Prophet Mohammad and his daughter had an extremely powerful relationship. Even Ayisha, the Prophets wife has spoken about the strong relationship between Mohammad (SAW) and Fatima; â€œNever have I seen anyone like the Messenger of Allah, in his solemn way of standing and sitting, more than Fatima, may Allah grant her more honor. When she came to see him, he would rise to his feet, take her hand, kiss her, and seat her where he was seated. And when he came in to see her, she would stand up, kiss his feet, kiss him, and seat him where she was seatedâ€. Aiyisha has also said: â€œNever have I seen anyone resembling the Prophet of Allah, in his way of speaking and talking, better than Fatimaâ€. When people threw rocks at the Prophet of Allah, it was Fatima that came and cleaned and helped. And as much as Fatima loved the Prophet, he loved her back. Without Fatima Zahra there is no Islam, because Fatima is our model. She sets an example and we have to follow it as much as possible. She is the most important lady on this universe and shall always be. When we wear our hijab we should be proud because we are copying Fatima, who after all is the Mistress of All Women. When we help others and give charity we again should be proud because we are doing as Fatima would have done. An example of her generosity is when on her wedding day, a poor lady came and asked for some clothes. Fatima had only two dresses, the new one that she was going to wear on the wedding and an old one. Fatima gave her new wedding dress instead of the old one. Fatima Zahra is, and should be the inspiration of all women and should be emulated. She was exactly like her father, Prophet Mohammad, and we too should strive to at least be like her. We should learn from her honesty, modesty and loyalty. When Fatima reached seven years old, a tragedy occurred in her life. Her dear mother, Lady Khadija had passed away. It brought sadness to her heart. During Khadija’s last days the Prophet said to her: â€œWhat you are encountering is because of us Khadija; when you meet your peers send my salams to them!â€ â€œWho are they O Prophet of Allah?â€ Khadija asked. â€œMariam bint Imran, Kulthum, Musas sister, and Asiya, Pharaohâ€™s wifeâ€, he answered. She then said, â€œMay you live in harmony and have son O Prophet of Allahâ€. Asma bint Umais once witnessed Lady Khadija crying and so she asked, â€œWhy are you crying while you are the Prophetâ€™s wife, and you will enter paradise as he has said?â€ â€œI am not crying (for fear of death), rather, I am crying because every woman needs a close friend on her wedding night to tell her secrets and to help her in certain issues, and Fatima is still very young and I am afraid that she will be alone on her wedding nightâ€. At the age of 63 Lady Khadija died. Deep sadness appeared in the Prophetâ€™s heart, and not long after, his uncle Abu Talib died. The year in which his wife and uncle died was called â€œThe year of sorrowâ€. When Khadija died it was a disaster to the Prophet. Not only because she was his wife, but also because she was the first one to believe that he was the Messenger of God, and also because she supported him by sharing her property for the sake of Islam. When Fatima reached the age of nine, she was fully mature. Abu Bakr and Umar were one of the people, who asked for her hand, but the Prophet rejected them and he ignored Abdarrahman ibne Awfâ€™s proposal. When Imam Ali approached the Prophet to ask for the hand of Fatima. The Prophet went in to ask Fatima as to her decision, but she was silent. Her silence was her approval. Gabriel came to the Prophet, along with many other angels, in order to congratulate him. He also told him that he was ordered by Allah to name him after Prophet Harounâ€™s second son. Fatima and Aliâ€™s second child was born, Imam Husain, was born on the 3rd of Shaban. Lady Zaynab was born on the 5th Jamadi Awal, and she was the third child born to Fatima and Ali. Lady Um Kulthum was the fourth child born in this union. Fatima then walked to the tomb of the Prophet; she had difficulties walking, as she could not see that well because her tears covered her eyes. Fatima was not to live for much longer after her father. Fatima was in her house when Umar and his men were trying to get inside. As the door was breaking, there would not be enough time for her to go and get her scarf, so she stood behind the door. Umar pushed the door open and the handle hit Fatimaâ€™s stomach. She was pregnant with her baby Mohsin, which died instantly, and she a few months later also passed away as a result of the injuries caused to her by the door. Her death was on 3rd Jamadi Thani, 11 (a.h.) . She was only eighteen years old when she died.